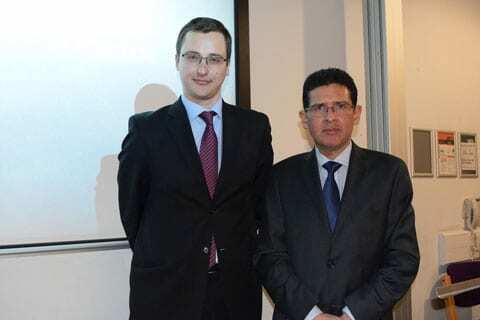 On Friday, 13 November 2015, Dr Diego Garcia Carrion, the Attorney General for Ecuador came to UCL to present his book “Chevron Case: Defense of Ecuador”, and discuss the Ecuadorian position in one of the most important and controversial international dispute settlement cases at the moment – Chevron v. Ecuador. Importantly, the event was not intended to constitute a full and exhaustive legal or factual discussion of the case and the parties’ contentions, but merely a presentation of the main points of the Ecuadorian perspective. The Ecuadorean Attorney General’s presentation was co-organised by UCL Laws and UCL Global Governance Institute and Investment Law and Policy. Dr Martins Paparinskis, convenor of International Law of Foreign Investments course at UCL Laws, chaired the event. The event was filmed by the Ecuadorian Embassy, and complimentary copies of the book were handed to the participants. In brief, in September 2009 Chevron brought its claim against Ecuador to an investor-State arbitration tribunal under the US-Ecuador BIT. The claim primarily alleges denial of justice by Ecuador’s courts in a domestic dispute relating to environmental and social harms due to contamination resulting from oil production in Lago Agrio region (Chevron’s position on the dispute). The case is still pending, and raises hard questions about international investment arbitration, which are of considerable conceptual and practical importance. Can international investment arbitration successfully address the public elements of private disputes? What is the role of parties, non-parties, and participants in investment arbitration? Can investment arbitration resolve the interplay between different substantive and procedural regimes of domestic and international law? Is ad hoc arbitration an appropriate regime of dispute settlement for dealing with legal and factual issues of such complexity? How do States’ representatives think and act upon these issues?